Dessai,S. and Hulme,M. (2001) Climatic implications of revised IPCC emissions scenarios, the Kyoto Protocol and quantification of uncertainties Integrated Assessment 2, 159-170. Giorgi,F., Hewitson,B., Christensen,H.J., Hulme,M., Von Storch,H., Whetton,P., Jones,R., Mearns,L.O. and Fu,C. (2001) Regional climate information evaluation and projections pp.583-638 in, Climate change 2001: the scientific basis (eds.) Houghton,J.T., Ding,Y., Griggs,D.J., Noguer,M., van der Linden,P.J., Dai,X., Maskell,K. and Johnson,C.A., Cambridge University Press, Cambridge, UK, 944pp. Goodess,C.M., Hulme,M. and Osborn,T.J. (2001) The identification and evaluation of suitable scenario development methods for the estimation of future probabilities of extreme weather events Tyndall Centre Working Paper No.6, Tyndall Centre, Norwich, 46pp. Horton,E.B., Parker,D.E., Folland,C.K., Jones,P.D. and Hulme,M. (2001) The effect of increasing the mean on the percentage of extreme values in Gaussian and skew distributions. Response to X. Zhang et al. Climatic Change, 50(4), 509-510. Hulme,M. (2001) Integrated assessment models Tyndall Centre Working Paper No.2, Tyndall Centre, Norwich, 17pp. Hulme,M. (2001) Climatic perspectives on Sahelian desiccation: 1973-1998 Global Environmental Change 11, 19-29. Hulme,M., Doherty,R.M., Ngara,T., New,M.G. and Lister,D. 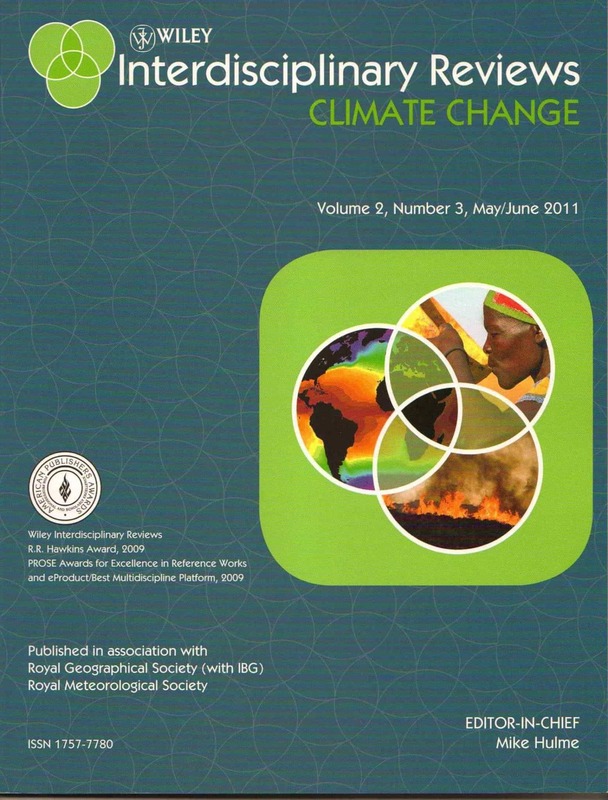 (2001) African climate change: 1900-2100 Climate Research 17, 145-168. Hulme,M., Crossley,J. and Lu,X. (2001) An exploration of regional climate change scenarios for Scotland The Scottish Executive Central Research Unit, Edinburgh, 50pp. Hulme,M. (2001) Classics in physical geography revisited – the effects of doubling the CO2 concentration on the climate of a general circulation model. (Reprinted from Journal of the Atmospheric Sciences (1975) 32, 3-15) Progress in Physical Geography 25(3), 385-387. Hulme,M. (2001) New Tyndall Centre to encourage integrated climate research Ocean Challenge 10, 15-16. Hulme,M. (2001) 40 ways to change a world climate Book review of â€˜Emissions scenarios: special report to the IPCCâ€™ (eds.) Nakicenovic,N. and Swart,R., Times Higher Education Supplement (2 February), p.30. Hulme,M. (2001) Black gold blackens future Book reviews of â€˜The collapse of the Kyoto Protocol and the struggle to slow global warmingâ€™ by D.Victor and â€˜Climate change impacts on the United States: the potential consequences of climate variability and changeâ€™ (ed.) National Assessment Synthesis Team, Times Higher Education Supplement (22 June), p.25. Mearns,L.O., Hulme,M., Carter,T.R., Lal,M., Leemans,R. and Whetton,P.H. (2001) Climate scenario development pp.739-768 in, Climate change 2001: the scientific basis (eds.) Houghton,J.T., Ding,Y., Griggs,D.J., Noguer,M., van der Linden,P.J., Dai,X., Maskell,K. and Johnson,C.A. Cambridge University Press, Cambridge, UK, 944pp. New,M., Todd,M., Hulme,M. and Jones,P.D. (2001) Precipitation trends and measurements in the twentieth century International Journal of Climatology 21(15), 1899-1922. Sear,C., Hulme,M., Adger,W.N. and Brown,K. (2001) The impacts of global climate change on the British Overseas Territories Report to DFID Overseas Territories Unit, London, 38pp + Annexes. Sear,C., Hulme,M. Adger,W.N. and Brown,K. (2001) The impacts of global climate change on the British Overseas Territories Technical Report and Stakeholder Survey, Tyndall Centre Technical Report, Norwich, 51pp.